Looks like spring to me! Just in case there’s any question, the market will be open normal hours this week. Really, the Stone Building will be open extra hours on Friday evening. Still on sale are The Sweet Farm’s Almost Sour pickles. Still some left! We’ve got more signs of spring! 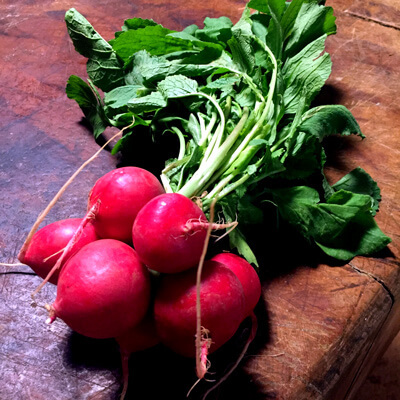 Good quantities of greens (salad and braising) continue, and red radishes make their debut! It is technically still winter, and it certainly feels like winter (for once), but we are starting to see signs of spring — this week, abundant spinach and mesclun, a smattering of other salad greens, and some gorgeous bunches of Red Russian Kale, along with the first red radishes of the season. On top of all that, it’s after 7pm, and it’s still light out. These are exciting times. And weird, though I guess since it is still technically winter, it’s not the snow that should seem weird, but how mild (and even warm) the rest of the winter has been. And, I will say, I did rather enjoy our snow day, which was a lovely combination of work and play. Since I am usually working from home on Tuesdays (and all the non-Market days), it didn’t mean a forced day as it did for many, so I worked in the morning on ordering and taxes (ugh), and then turned the computer over to Dusty for the afternoon so he could do the weekly bookkeeping (if only I could get him to do the taxes!). I then had the luxury of spending much of the afternoon on the couch watching Dr Thorne and enjoying the aromas of the beef & mushroom stock Dusty had started while I worked in the morning. This was a stove-top project, perhaps mostly because the quantity he was making stood no chance of fitting into the Instant Pot, but also because he’s pretty obsessed right now with making a gelée or aspic of some kind, and so wanted lots of evaporation along the way. We haven’t actually eaten any yet, but it’s looking pretty good. The best part of snow days in the city, though, is being able to traipse to nearby bars for cozy and low-key evenings (at least we waited till evening). Our first stop was the Millworks, which opened just its bar and pizza oven, staffed perhaps entirely with employees who could walk to work. I don’t know if I’ve said this before, but their pulled pork pizza with pickled onions is just about the best pizza I’ve ever had, and so I am always happy for an excuse to eat it. I was also happy to run into neighborhood friends, and enjoy the feeling of being embedded in community. After the Millworks we ventured off to a very different scene at Shady McGrady’s down Verbeke St, where things were still cozy, but, er, a little less low-key. It, too, was full of neighbors and friends, and we talked about the joys of city living, what affect the storm would have on this week’s deliveries (very little, it turns out), and how different people experience music differently. And then we traipsed back home, a hideous wind blowing snow into our faces, and I thought, as lovely as the snow day was — I’m very happy that spring is almost here.